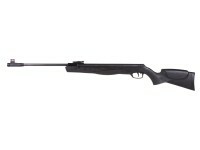 The Walther Parrus air rifle is a powerful, single-shot breakbarrel air rifle with reliable magnum velocity. This spring-piston powered rifle is the next generation of the popular Terrus model, and it's steady cocking mechanism delivers muzzle energy of up to 22 foot pounds making it ideal for small game hunting. The .177 caliber version is capable of delivering pellets at up to 1300 feet per second, while the .22 caliber sends pellets at 1000 fps. The Parrus is equipped with an adjustable, metal rear sight and a TruGlo fiber optic front sight to help get you on target quickly. The 1/2" UNF threaded muzzle is popular with European shooters for its silenced recreational shooting. And adding to the list of features is the XT Trigger with its adjustable first-stage travel. The gun is ready for a scope with the 11mm dovetail rail, and it has a rubber recoil pad adding to its comfort. 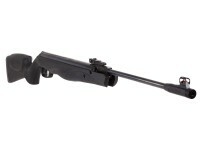 The ergonomic synthetic stock has Walther's Hi-Grip texturing for added grip. Right out of the box this powerful springer will catch your eye and offer hours of fun shooting. Things I liked: I like the weight and feel. I shoot from sticks or a rest, so the weight isn't an issue for me. I've put about 300 shots through it, and I'm still learning the exact technique it likes, as far as hold. Things I would have changed: Nothing. It's a superb rifle right out of the box! What others should know: Mine likes JSB Jumbo Heavies, 18.13 grain. It shoots other pellets, but just okay. The heavy pellets are real tack drivers though. Quarter inch groups at 10 yards, indoors. The rifle is somewhat hold sensitive, so practice, practice, practice, and patience, will be the key to unlocking the magic of this fine piece of German craftsmanship. Things I liked: I received this rifle three days ago and since the first shot out of the box ,with open sights, I'm convinced that this gun is on the same level of quality as the Diana - RWS 350 mag . The gun is as powerful or more than the 350 . Mine is .22 and it is making groups of 1/2 inch at 20 yards right out of the box with open sights. My gun has a polymer stock very solid and the contour, grip and balance is excellent. As for weight the gun comes in without scope a bit lighter than the 350 with wood stock. The price of this gun compared to the 350 is a buy. I've shot the gun with CPs 14.3 domes and they held thight groups , also tried the Gamo 15.43g wad cutters and they are functioned very well also. The open sights and trigger are plastic but of a very strong grade. Expect the gun to be stiff the first 100 or so shots ,after that you'll feel the break in. 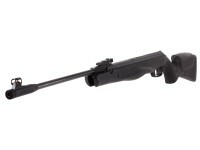 The Parrus is a German top of the line spring Powered air rifle- Walther hit the ball out of the park with this one. Things I would have changed: Mine was a bit dry , but that can be expected from new guns. Pyramyd should include the checkup free of cost in this level of quality guns. 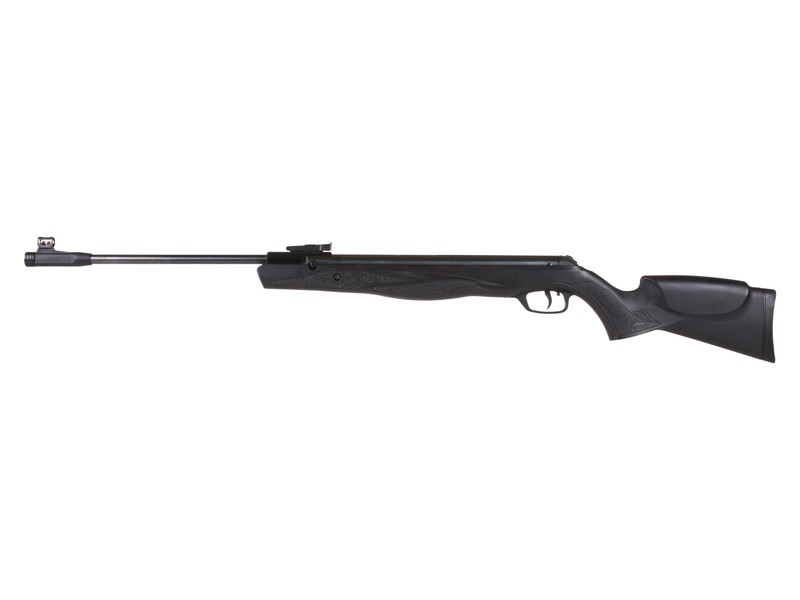 What others should know: This is a hunting rifle,not an all day plinker. If you want a plinker or for target practice buy a Diana 34 TO6 trigger in .177. The Parrus is a heavy hitter ,but it requires 40 maybe 50 pounds of cocking effort, so don't buy this for a kid or if you have physical problems in your arms. As for scope I installed an old Ruger 4x32 that I had lying around and to my surprise it's functioning excellent with this rifle : 1/2 inch groups at 20 yards and hits 2x2 inch targets at 40 yards- I don't expect the scope to last long on this mag , but it's shooting great now. These type of mag guns eat scopes. I wouldn't advise to buy this gun in .177 it had to much power for that caliber, but that's open to debate depending on the weight of the pellets. For me .22 is the way to go if you have hunting or pest control on your mind. Expect 24fp of power with 14 to 18 grain pellets, JSBs or CPs. The spring broke so I replace OEM spring 825130-42 with a Vortek 825135-39. It reduce the vibration by 90% and the recoil is less harsh then before. The cocking feels about the same. Before the gun was producing 22-23FPE with CPHP 14.3g. Now 26.4FPE with H&N 21.14g and 27.74FPE with JSB 18.13g. Now that a powerhouse. 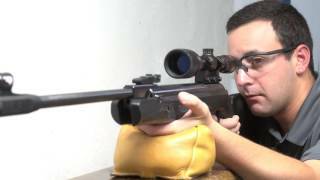 I had the opportunity to pass my Parrus 22 through the chronographs and its shooting the CPs 14.3 at 885 fps. I have shot well over 500 shots and the power and precision of the gun continues to be excellent. 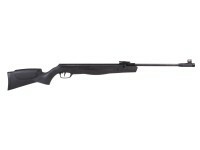 The Parrus is a rifle that power wise comes in between the gamo Hunter extreme (1250) and the Diana 350 mag. I've noticed that the barrel bolt and nut tend to loosen with use and if retightened will affect the previous sight or scope adjustment. For those who want to know the size of its spring it at .135 inch X 42 coils and the compression tube I believe to be 30mm. The gun is a powerhouse- I just love to shoot it. Things I liked: Accuracy.This is one accurate gun.I have put 500 JSB 15.89 down the barrel plus FTT,CP,Polymags and Terminaters.It does not appear pellet fussy.Nice and smooth cocking.Breaking open the gun can be difficult at first,but it soon smooths out.I got the synthetic stock over the wood.The balance is excellent.The trigger is great ,nice and wide,with a great two stage that breaks crisply. What others should know: The breech seal and lock up are first class.well worth the price.You might need a new back stop by the time you have fired a couple of tins of pellets.This air gun really packs a punch. I would go for the Parrus. Do these rifles have the "Stopshox" anti recoil as indicated they would in the 2016 shot show? Billy. The shooter has to aim the gun? Really? Thanks for making me laugh. Stay safe. Got an answer from the Consumer Services Tech at Umarex on this question. "The Parrus, like most other air guns is more dependent upon the shooter for its accuracy than the gun itself. The LGV does have a vibration dampening system that the Parrus does not, but you should be able to shoot the Parrus very close, if not as well as the LGV."